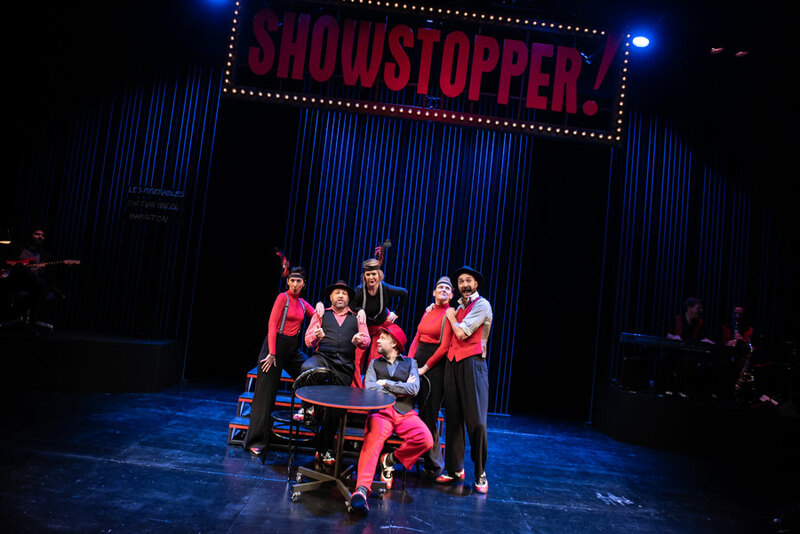 Sophie Adnitt reviews Showstopper The Improvised Musical which is currently playing an extended season at The Other Palace London. Improvised shows are difficult things to review. In the case of Showstopper! I could tell you all about Allota Dancin’ (a St Ives-set musical following the trials and tribulations of the local allotment society), but the fact remains that you’ll never get the chance to see it. See, what Showstopper! 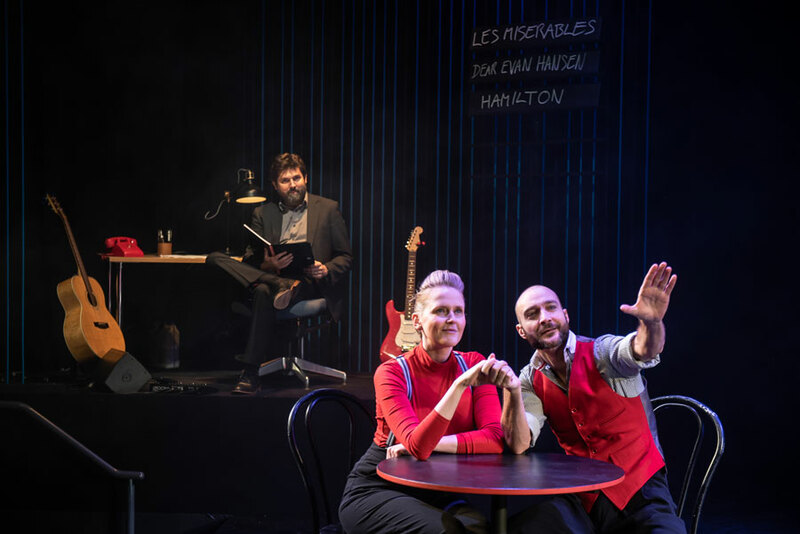 does is create a brand new musical every night, for one night only, and they have done so since 2007, racking up over 1000 performances via national tours, Edinburgh Fringe appearances and now an eight week run at Victoria’s The Other Palace theatre. Having championed new musicals in the past, the choice of venue feels somewhat apt. We’re introduced to a nameless writer (played by the excellently witty Dylan Emery, exercising a fabulous rapport with the audience), who is commissioned over the phone by his producer ‘Cameron’ (cue wry chuckles from the audience) to write a new hit musical in just under two hours. No problem, says the writer, before asking the audience for their help with a setting, a title and some musical styles. These are duly shouted out by those watching; Little Women, Rent, Wicked – at this Emery suggests the audience member could simply pop up the road to the Apollo Victoria – and 42nd Street (plus a Sweeney Todd-inspired number that sneaks in post-interval) all feature in the mixed bag of influences that is musical number 1001: Allota Dancin’. Now we get to the part that Showstopper! 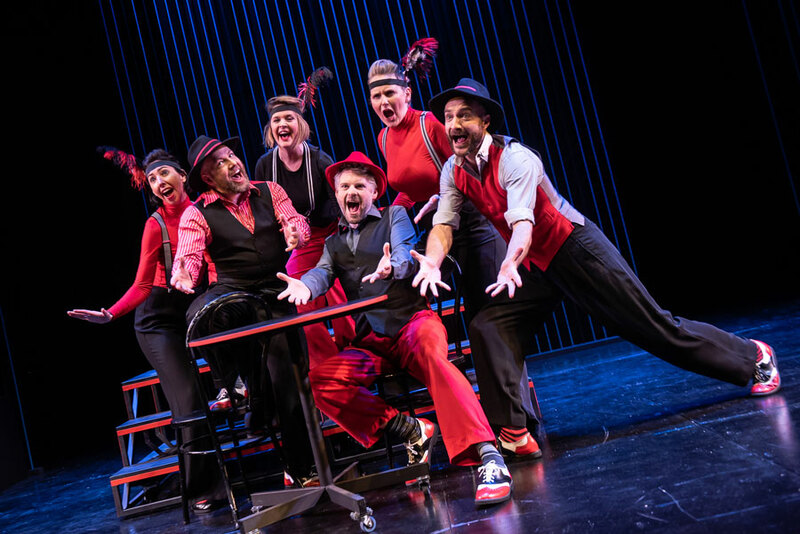 is renowned for, a wholly improvised musical with an increasingly convoluted storyline, songs and dance routines. 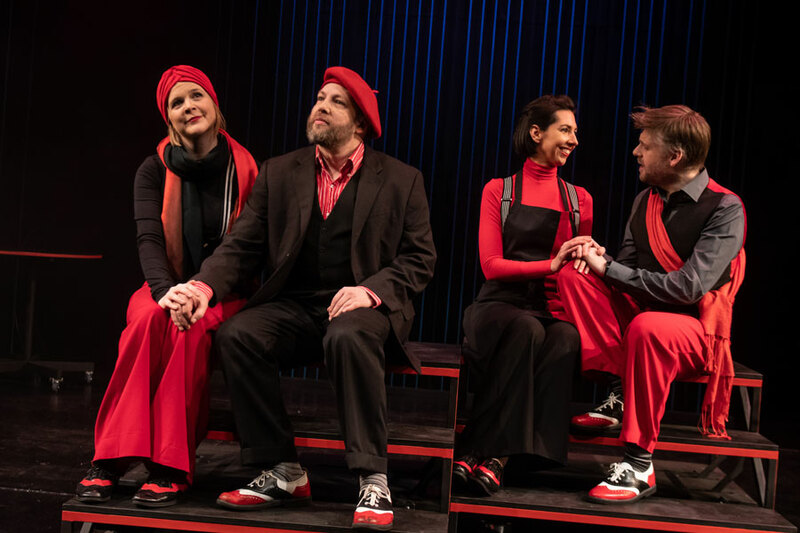 A team of six performers, clad in their trademark red and black and armed with an assortment of props and hats, create a show that really is unlike any other. The result is utterly hysterical. All six performers are immensely intelligent, thinking lightning quick on their feet and hugely knowledgeable, pulling in music styles, iconic lines and funny little twists at a moment’s notice. It helps to already be a bit of a musicals buff before entering the auditorium to catch all the references and stagey in-jokes, but honestly this company are funny enough to appeal to all fans, no matter how fairweather. A tap-infused 42nd Street-inspired number on allotment rules and regulations is sheer genius and the decision for two otherwise idle cast members to take on the roles of ‘pasty crones’ ends up being a comedic highlight. Some of the best moments are when it all goes slightly wrong – a performer will flounder on an awkward rhyme whilst their colleagues look on in glee, or Emery himself will freeze the action to suggest some ludicrous challenge for the performers (the thinly veiled looks of silent horror he receives in response are hilarious). The sheer willingness of the performers to carry on regardless is hugely admirable and incredibly endearing to all watching. The numerous plotlines of Allota Dancin’ eventually come together in a joyous finale that lends itself to a well-received and highly deserved encore. As with all improvised shows of this nature, there is the rare tendency to labour the point a little (possibly to buy time whilst thinking of what comes next), but on the whole, even a thousand musicals deep, Showstopper! is still fully capable of producing a thoroughly entertaining, and ever unique, evening.